AWS Educate has launched a RoboMaker Classroom in collaboration with AWS RoboMaker to provide students, researchers, and educators with a new way to accelerate robotics learning. This centralized classroom has been the most requested feature by instructors who want to use AWS RoboMaker with their students. AWS RoboMaker removes the heavy lifting from each step of robotics development, making it easier to develop, test, and deploy intelligent robotics applications. It extends the most widely used open-source robotics software framework, Robot Operating System (ROS), with cloud-based services. Students can develop code using the Cloud9 development environment, test in Gazebo simulation, and then deploy finished code to a fleet of one or more robots. Students can also choose to integrate other AWS machine learning services, monitoring services, and analytics services – like Amazon Lex, Amazon Polly, Amazon Rekognition, Amazon CloudWatch, and Amazon Kinesis – that enable a robot to stream data, navigate, communicate, comprehend, and learn. 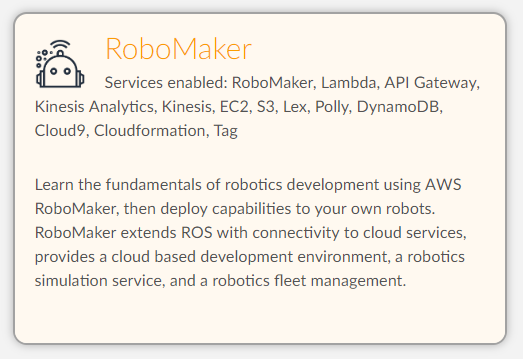 With the new Robotics Classroom on AWS Educate, educators can request AWS Promotional Credits and set up a virtual environment for students to use AWS RoboMaker in projects and assignments. Once registered, educators can invite or remove and collaborate with students in their accounts, monitor usage, and view their activity. “AWS RoboMaker classroom makes AWS account management for the classroom setting much easier for deployment in an educational setting. The streamlined development process from writing code to running a simulation will be invaluable for teaching our students robotics with minimal infrastructure cost,” said David Millard, Robotic Embedded Systems Laboratory, University of Southern California. To learn more about AWS Educate, visit aws.amazon.com/education/awseducate. To learn more about AWS RoboMaker, visit aws.amazon.com/robomaker or contact aws-robomaker-academics@amazon.com.